Hey kids! It's Christmas time again! The time to send Christmas greeting cards, sing carols, gorge on cakes and other delightful delicacies, time to make merry with friends and family, to enjoy, wait for Santa and get loads of gifts. So many facts are associated with this wonderful season. But do you know them all? 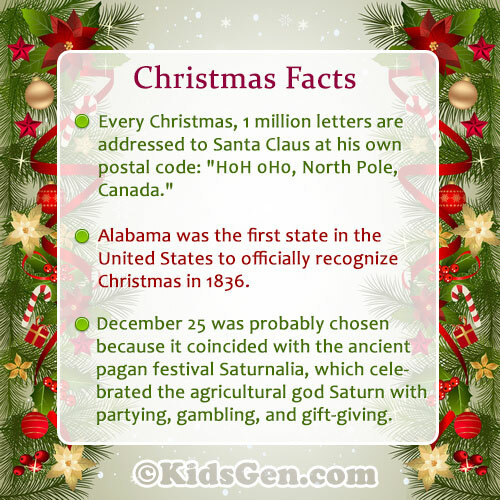 Here we bring to you a collection of popular Christmas Facts. Read on. It will give you a better idea about the occasion. Know about the different beliefs and the history behind the popular traditions associated with Christmas all around the world. If you like our collection, do not forget to click here to refer this page to your friends. Wish you all a JOLLY CHRISTMAS from the kidsgen family!!! The traditional colors of Christmas decorations are red, green and gold. Red symbolizes the blood of Jesus, which was shed in his crucifixion. Green symbolizes eternal life. Gold is the first color associated with Christmas symbolizing royalty. 36 million Christmas Trees are produced each year. Christmas trees takes almost 7-10 years to mature. In the Ukraine, if you find a spider web in the house on Christmas morning, it is believed to be a harbinger of good luck! This belief resulted from an old Ukrainian folk tale, which told the story of a very poor woman. So poor was she, that she could not even afford Christmas decorations for her family. One Christmas morning, she awoke to find that spiders had trimmed her children's tree with their webs. When the morning sun shone on them, the webs turned to silver and gold. The woman took this as a godsend and her misery ended forever. An artificial spider and web are, thus,often included in the decorations on Ukrainian Christmas trees. A famous Christmas tradition is to exchange kisses beneath the mistletoe tree. Though the reason behind the choice of mistletoe in this custom is not properly known, it may be well to remember that in ancient Scandinavia, mistletoe was associated with peace and friendship. That may account for the custom of "kissing beneath the mistletoe". Have you ever heard of "Hot cockles"? It was a popular game at Christmas in medieval times. In this game, a player was blindfolded and the other players took turns striking the blindfolded player, who had to guess the name of the person delivering each blow. "Hot cockles" remained a Christmas pastime until the Victorian era. In many households, part of the fun of eating Christmas pudding is finding a trinket that predicts your fortune for the coming year. For instance, finding a coin means you will become wealthy. A ring means you will get married; while a button predicts bachelorhood. The idea of hiding something in the pudding comes from the tradition in the Middle Ages of hiding a bean in a cake that was served on Twelfth Night. Whoever found the bean was held as the "king" for the rest of the night. Christmas Pudding originates from an old, Celtic dish known as "Frumenty". Frumenty was a spiced porridge, enjoyed by both rich and poor. It was a forerunner of modern Christmas puddings. According to the old Celtic legend, it is linked to the Celtic god Dagda, who stirred a porridge made up of all the good things of the earth. In Greek legend, malicious creatures called Kallikantzaroi sometimes play troublesome pranks at Christmas time. In order to get rid of them, salt or an old shoe is burnt. The pungent burning stench drives off, or at least helps discourage, the Kallikantzaroi. Other techniques include hanging a pig's jawbone by the door and keeping a large fire so that they can't sneak down the chimney. The poinsettia is a traditional Christmas flower. In Mexico (its original birthplace), the poinsettia is known as the "Flower of the Holy Night". Since the 19th century, the poinsettia has been associated with Christmas. Louis Prang, a Bavarian-born lithographer who came to the USA from Germany in the 19th century, popularized the sending of printed Christmas cards. He invented a way of reproducing color oil paintings,known as the "chromolithograph technique", and created a card with the message "Merry Christmas" as a way of showing it off. The "Urn of Fate" is part of the Christmas celebrations in many Italian households. The Urn of Fate is brought out on Christmas Eve. But what is it? The mother tries her luck first, then the others in turn. If you get a present with your name on it, you keep it; otherwise, you put it back and try again. The Urn of Fate, an old Italian tradition, is a large ornamental bowl that holds wrapped gifts for members of the family. When the family gets together, each member takes his turn at drawing a gift from the urn until all the presents are distributed. Santa Claus has two addresses - Edinburgh & North Pole. Letters addressed to "Toyland" or "Snowland" go to Edinburgh, but letters addressed to "The North Pole" are really sent to the North Pole because, as you know, there is really such a place. In 1647, Christmas was made illegal by a law that was passed by the English Parliament. Christmas festivities were banned by Puritan leader Oliver Cromwell, who considered feasting and revelry as immoral actions that were performed on the holy day that Christmas was. It was only when the Puritans lost power in 1660, that the strict ban on Christmas was lifted. The first Christmas Pudding was made as a kind of soup with raisins and wine in it. Have you heard of "Animal Crackers"? Are these crackers made by animals? Not really! These are cookies that were imported to the United States from England in the late 1800s. Barnum's circus-like boxes were designed with a string handle so that they could be hung on a Christmas tree.